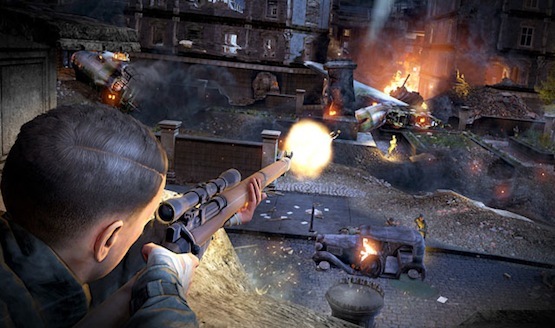 Rebellion has revealed the Sniper Elite V2 Remastered release date. The sniping extravaganza will come to digital and physical storefronts on May 14, 2019. The company has also set a price for the title. This remastered trip back to World War II era Europe will be sold for $34.99/£29.99/€34.99. If you decide to preorder the game digitally, there will be a 10% discount. UK publisher Sold Out will be distributing the game’s PS4, Xbox One, and Switch versions to stores. We do not know, however, which territories the physical version will be available in. The UK developer has seemingly packed a lot into this remaster, with 4K resolution, HDR compatibility, new playable characters from the Zombie Army series, a new photo mode, and all of the content previously available for the game available immediately here. The company has also added a modernized renderer, new post processing effects, better level geometry, more detailed textures and particles, and a new lighting system, so those satisfying X-ray kills will likely look even cleaner than before. On top of all that, multiplayer is back and there can be up to 16 players in every match. The Oxford based developer also lined up a few other announcements for the series in March 2019, with a new Sniper Elite VR game from Oddworld and Gravity Crash studio Just Add Water revealed and word that Sniper Elite 4 is in development. Will you take the fight to the Nazis in WW2 era Berlin as OSS agent Karl Fairburn or will you retreat from this mission?